London (CNN) -- The biggest fashion show on earth, the royal wedding, got underway in a riot of bright colors, flamboyant fascinators and larger-than-life hats. 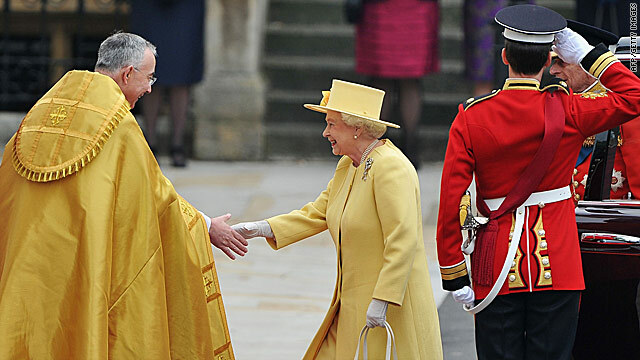 The Queen cut a particularly cheerful figure in a primrose-yellow double crepe wool coat and matching wool dress by Angela Kelly, with hand-sown beading at the neck in the shape of sunrays. Mother-of-the-bride Carole Middleton's outfit was hotly anticipated, after she reportedly rejected the outfit specially made for her by leading British couturier Lindka Cierach at the eleventh hour. On the day, she opted for an elegant and subtle number from tried-and-trusted couturier Catherine Walker, a French-born designer based in London who was a favorite with Princess Diana. Walker created a sky-blue wool crepe coatdress for her, with matching satin piping and trimming at the waist and cuff, worn over a sky-blue silk shantung "Sydney" day dress with short pleated sleeves and pockets. Mrs. Middleton's hat was by Berkshire-based Jane Corbett. The Duchess of Cornwall stayed loyal to designer Anna Valentine -- the woman who designed her wedding outfits and is credited with revamping her image. She wore a champagne silk dress and a duck-egg blue and champagne coat with hand-embroidered detailing, teamed with a hat by her favorite milliner, Philip Treacy, and shoes by Jimmy Choo. Queen of fashion Victoria Beckham made an elegant arrival dressed in one of her own autumn/winter creations, specially altered to take account of her baby bump. She cut a demure figure in the knee-length navy number, matched with a pillbox Philip Treacy hat adorned with gravity-defying embellishments, her hair slicked back in a ponytail. Her husband David played it safe in a grey tie and morning suit by Ralph Lauren. He carried a top hat and sported his Order of the British Empire medal -- as well as his trademark designer stubble. Other guests arriving at Westminster Abbey for Prince William and Kate Middleton's wedding were more colorful, with bright blues, pinks, yellows and greens scattered throughout the crowd. Chelsy Davy, Prince Harry's on-off girlfriend, set off her blonde good looks in a glamorous off-the-shoulder turquoise two-piece, with a playful bow on the back. The Queen's granddaughter Princess Eugenie wore a less successful aqua-blue number and small feathered hat, while sister Beatrice went for a summery pale peach, teamed with a statement hat. Hats were the big talking point of the day, as many guests jazzed up their formal outfits with creations by milliner-to-the-stars Philip Treacy. Tara Palmer-Tomkinson, socialite and friend of Prince Charles, sported a bright royal blue dress and matching daring teardrop-shaped pillbox hat by British designer Stephen Jones. Meanwhile, Elton John put aside his normally flamboyant style, wearing a bespoke black morning suit brightened only by a cream waistcoat and purple tie. Not to be outdone by the celebrities, British politicians' wives showed off their fashion credentials on the Westminster Abbey red carpet. Deputy Prime Minister Nick Clegg's wife, Miriam Gonzalez Durantez, won the vote for most eye-popping headwear, with an enormous exotic red creation topping off a bizarre metallic and black-gauze dress. Prime Minister David Cameron's wife, Samantha Cameron -- known for her good fashion sense -- eschewed a hat for a feathery barrette teamed with a short-sleeved, figure-hugging teal-green number. The prize for bravery, however, went to Foreign Secretary William Hague's wife Ffion, who turned up looking elegant despite being in a wheelchair, following a recent fall that left her with a broken shin.